Habana Restaurant & Bar - mmm-yoso!!! 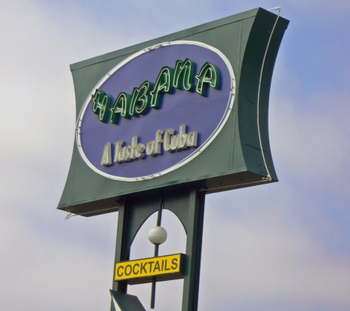 I'd recently heard about a new Cuban Restaurant that recently opened in La Mesa, from reader and frequent commenter Reynila and My good friend and frequent contributor to Chowhound, Gayla. During a quick call to Habana I found out that during Happy Hour(between 4-6 pm) all appetizers are half price, and specialty drinks are $2 off! A good deal. Needless to say, we had a bunch of appetizers. All appetizer prices in the post, are the "menu" prices. To calculate Happy Hour prices, divide by '2'. We arrived at approximately 430pm, and found Habana empty. 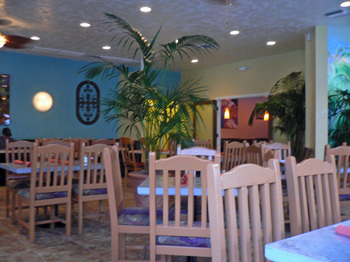 The large dining area goes for a tropical feel. The Missus tried a Habanatini($7 - $5 Happy Hour). Kind of on the weak side, but ok overall. We looked over the menu and started ordering. We decided on 5 appetizers, and ordered one entree to share. 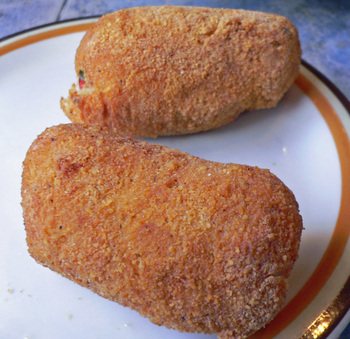 The croquettes were moist and fairly light, though I really could not taste any chicken. As a whole fairly unremarkable. 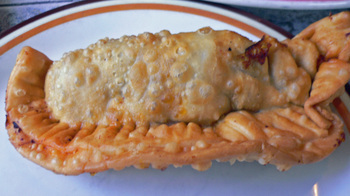 The empananda was quite large, and the exterior was nicely fried and crisp. The filling was pretty dry and the flavor was on the mild side. 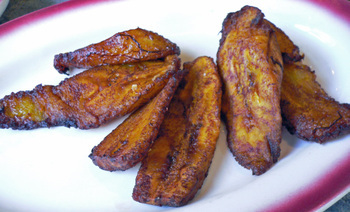 The Maduros (Fried Plantains - $4.25), fried well, with a nice sweetness that wasn't cloying. Overall, quite nicely done. Yuca Frita (Fried yuca), served with a "mojo" ($4.50). The Yuca was crisp on the outside, and moist on the inside. There was a mild sweet flavor to go with the slightly dense stachy interior. 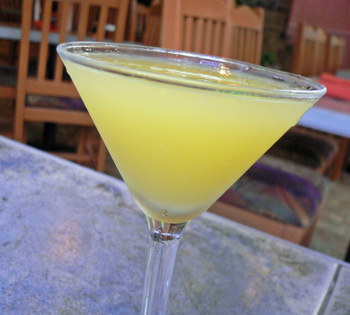 The "mojo" was a flavorful concoction. The menu said the yuca was served with a garlic sauce, but we were sure that there was some meat in the sauce. Our suspicions were confirmed when we asked what was in the sauce, and the word "pork" was mentioned. No wonder it was so tasty! The Yuca con Mojo - the best dish of the night ($3.95). 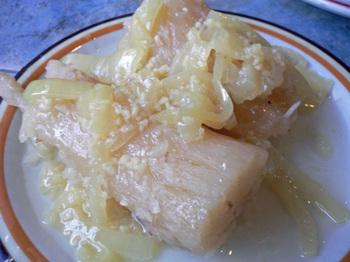 The boiled Yuca was served with a lemon-olive oil-garlic sauce that bordered on addictive. The sauteed onions added an almost sweet flavor to the dish. We also ordered one entree to share. 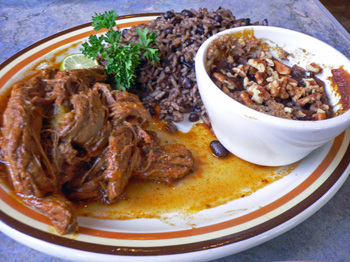 The classic Cuban Dish, Ropa Vieja($11.50), we ordered Arroz Morro and Papa Dulce Roja(Yams) as our "sides". The dish was a disappointment. The Arroz Morro, supposedly black beans and rice simmered in wine was flavorless. The black beans were also very hard. The yams were nothing special either. The Ropa Vieja was dry and tough, and very mild in flavor. 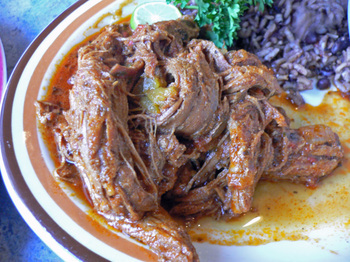 Of the four version of Ropa Vieja I've had so far, this is ranked at a solid "number 4". I forwarded the photos of the menu to Jim the Brunchmaster. One last item, our Server, Amy, was excellent. So nice and efficient. wow, you went to habana already! : ) i'm going there again on father's day (for my husband)...there's some other dishes i've got to try. looking forward to the rest of your post. Those empanadas look good. 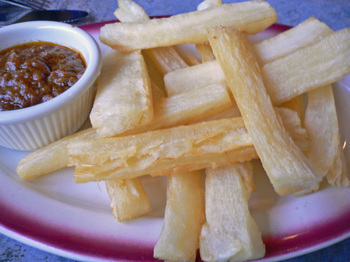 I love yuca too but I'm a yuca snob because I had some amazing yuca in Montrose (L.A.). I'll have to try out that restaurant. I miss Cuban food! We had some great Cuban food in D.C. (where I'm from). If you haven't experienced it yet, definitely try the double double and especially the fries, "animal style". I know you're not too crazy about their usual fries but this style will undoubtedly change your mind! I keep hearing good things about this place, so I'm looking forward to reading your review... so far, the pics make it look quite yummy! Hi Reynila - Thanks for letting us know about Habana! Hi Roger - Having lived in SoCal for the last 9 years I know all about I 'N' O's secret menu. Still I like mines without spread. Hi Kristy - The empanada was fairly large, but the filling was a bit disappointing. Hi Joan - The dishes we had were fairly uneven, but the Happy Hour specials are really reasonable. Look at how they filled that cocktail glass right up to the brim. No wonder it was weak; it would take a double shot of liquor to make up for all that water and mixer. I assume they want to make you feel like you are getting a good deal by filling up the glass. It's like eating an omelet at Denny's; even three eggs get lost under all the other junk they throw in there. Hi Jim - That looks really good. I'm glad you enjoyed yourselves. Hi Juan - Thanks for the recommendation. Recently, I overheard a woman saying that a soul food restaurant - better than Magnolia's - had taken up residence where Sherman's had once been. In that space, a pho restaurant had come and gone, so it was reasonable to think someone had installed another restaurant there. So last Friday, the wife and I drove to La Mesa expecting to dine on étouffée, catfish, collards and the like. To our dismay, we found that there's nothing in Sherman’s space but rubble and cobwebs. I learned (again) never to plan dinner around gossip. Hungry and having promised my wife supper, I took us to nearby Habana. I'd seen the place, but in 1998 I was so disappointed by Andre's that I avoided local Cuban cuisine for the next nine years. I was skeptical of Habana, but the sign was pretty, and the tunes floating across the patio seemed authentic, so we took a flyer. The bar was noisy, offering live musicians and lots of customers not much younger or more beautiful than ourselves, but the dining room wasn't crowded, so we found a quiet corner near the outdoor patio/cigar lounge and settled in with menus. We were immediately enticed by words like "garlic", "yuca" and of course, "lechon," and our waitress Leah promised quick delivery of appetizers. Five minutes later, we were snacking. First, I tried the Tamal Yucatan, a pork tamale wrapped in banana leaf and steamed to tenderness. The flavor was marvelous; just spicy, slightly sweet. A touch of mojo (olive oil, garlic, onion and lemon) made this Caribbean polenta sing! 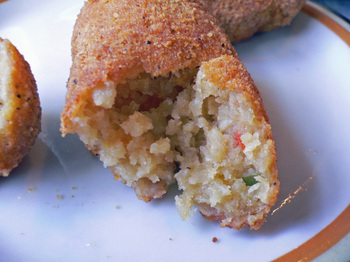 My wife and I shared the Papa Rellena: deep fried mashed potato balls filled with "picadillo" ground beef. 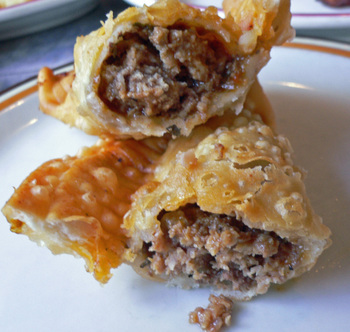 The crust was crisp and greaseless; the inside, fluffy, rich and light, with meat and cheese adding excellent flavor. Frankly, the potatoes were so tasty that the filling seemed extraneous, but I ate it anyway, not wishing to waste food. The kitchen dished up my entree too quickly, so I returned the dinner plate and said I didn't want that one served to me later. When I was ready for my main, Leah brought what appeared to be different food, and more of it. How was dinner? Well, good Cuban food is very good indeed, and ours was superb. My wife enjoyed Camerones Salteado, shrimp sauted in a fresh Creole sauce that was savory, sweet and spicy all at once. She's usually willing to share, so I was surprised at having to negotiate a sample of her dish. I'd ordered Lechon De Puerco (fried pork chunks, per the menu), white rice and black beans, which, according to my beloved, suggested a lack of adventurousness on my part. I said: "It's like ordering Pad Thai on a first visit to a Thai place. I’m just establishing a baseline." Fake scientific methodology aside, I like a lot of foods, but a plate of beans and rice with pork (whether Cuban style, feijão, diri ak pwa, or even Louisiana red beans 'n' rice) is one of my favorite things. Habana’s beans were firm to the bite, not hard like the ones Kirk tried a year ago, but I would have preferred them softer since more cooking yields more sauce/gravy. The rice was just right, and the pork… oh, that pork! all juicy and garlicky and mildly spiced, and tender; it was delicious meat, not seasoned rubber. Separating the large, silky strands, I tasted them with beans and rice and fondly recalled misspending some of my 30’s in South Florida, this while smiling innocently at my wife. We finished with café con leche and a portion of house-made pastel de tres leches. The coffee was sufficiently strong and sweet*, and the cake was perfectly dense and soaked through with sweet milks. The tab for this feast was surprisingly low: under $65, including drinks and an enthusiastic tip. It’s not often that I leave a restaurant feeling I’ve gotten value for my money, and that night, I went home gratified. I regret being the last yoso reader to find Habana (yoso late? ), but I’m happy I did, and we’ll return before this month’s out. * For some weeks in 1992, I visited Key West, staying at a youth hostel that didn’t offer laundry facilities. One morning, needing a fresh change of almost everything, I stopped up the street at a laundromat, stripped to my skivvies, and started washing clothes. About 1 p.m., an old man bumped backwards through the door, pulling a small fridge, two electric burners, a plancha (sandwich press), and a cutting board. The mobile Cuban pork sandwich/café con leche cart had arrived! Oh, it was Sherman's, and a Pho place, Ethiopian and then I did see a sign about Soul Food too, Omar, but am unsure it it was Ethiopian Soul Food or what. The place has been burned down for at least 9 months now, if my memory serves me right. 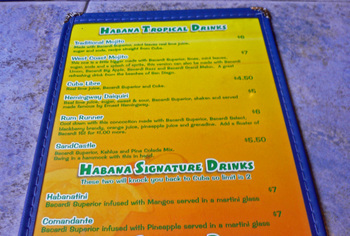 Like Kirk said, Happy Hour is always a safe choice and that is the only experience I have had eating at Habana. Kirk will enjoy reading your note once he gets back from Peru. 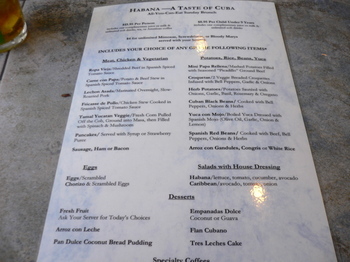 Does Habana have a authentic Cubana Tortas on the menu? i went to tj at this mall in a plaza at rio and they had the best cubaba sandwich ive ever tasted i cant find a place like it. I also went to andres and tried theres and i was very dispointed it was nothing like the one in tj.